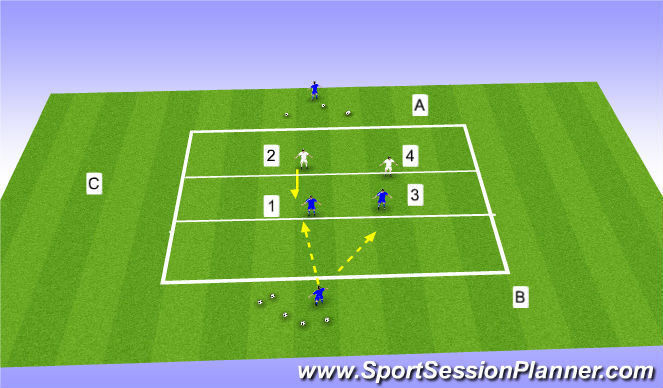 Players 1 and 3 and 2 and 4 start on respective lines.Ball played in to player 1 or 3.As soon as ball played, players 2 and 4 can move to close and prevent player turning/force delay or move backwards/if player 1 gets quick turn,prevent him dribbling past in 1v1.This will also require balancing between 2 and 4 to allow appropriate support and cover to be given - balancing off.Repeat with ball served in from player on line A. Encourage movement/disguise and combinations from receiving players to make defending more difficult. Can subsequently change places with all players so that they are involved in both attacking and defending. Communication - who will close?